After reading the Slammed series by Colleen Hoover, I always wanted to take part in a Poetry slam.So, when a friend told me about this one, of course I joined her. 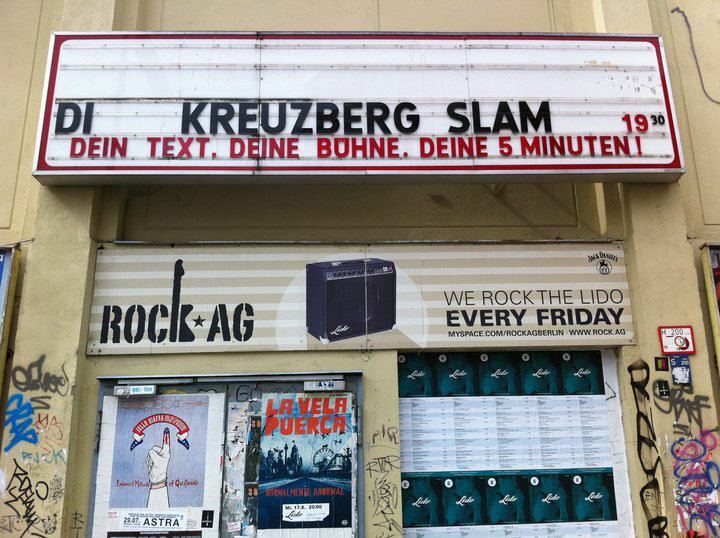 The Kreuzberg Slam is a Poetry Slam which takes part monthly in a Club called Lido in Kreuzberg (part of Berlin). Yesterday, there were 9 participants who were supposed to present their self-written pieces of literary in not more than 5 minutes without using anything exept of their mime and gestures. The 9 Slamers were put in groups of 3 – the one of each group who got the loudest applause was supposed to perform again in the big final.The atmosphere was awesome as there was only the stage, one microphone, the participants and lots and lots of people in the audience. Actually, there were so many people that they even had to sit on stage surrounding the person performing. Seeing people who you would never expect to create such beautiful pieces of literary and performing them on stage – that’s something which made the experience even better as the participants were really different.Not only they, also the texts they presented containing mostly political topics, German entertainment shows/acts like Germany’s next Topmodel or Helene Fischer or the problems during youth/childhood. Did I mention the one including Shades of Grey? See, very big variation of topics ;)Basically, there are no rules or things you have to observe while writing or performing so, some of them even sang the whole poem.I hope, that more people will use this possibility to enjoy an evening for 5€ including awesome performances, a lot of fun and lots of laughter which even made my stomach hurt. Luckily, Poetry Slam gets more and more famous, so that more people will be able to take part init.